Kids.They’re amazing mini humans who fill our lives with light,love and joy.They re also mini tyrants who drive us crazy with their wants and desires,so often at odds with our own adult ones. Mini is a lover of the yellow-beige-white spectrum of food.Chips,potato waffles,bread,yogurt. To be fair to her she does love fruit too but fruits are loaded with natural sugars so we try to portion them accordingly. She is not very adventurous and likes to stick with what she knows and loves.Which means scenes like this one being repeated more times than syndicated episodes of Friends. It’s dinner time. The day has been a mild success-the little people took their naps and are in fairly good humour approaching the hour of conflict or dinner time as it’s known in this house. So we approach dinner with our game faces on,a tough positive mental attitude and a whole host of other clichés. Tonight on the menu is meatballs in creamy tomato sauce and polenta. Mini objects before the plate is even placed in front of her. “No,no,no.”She shakes her head emphatically. 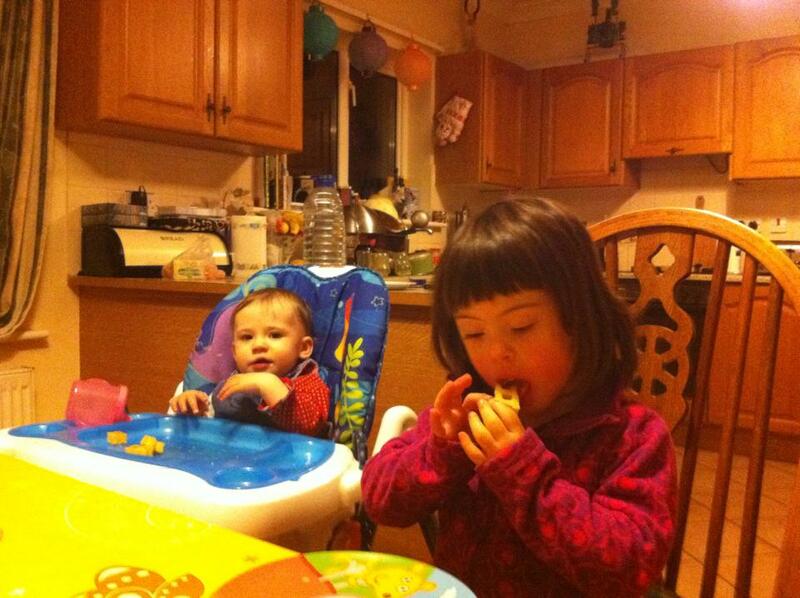 Mini Mini likes to try new tastes but takes her cue from her big sis.If Mini ain’t eating,neither is she. “What is wrong with you kids? “The Frenchman implores of his offspring,throwing his arms up in frustration.I feel a wave of sympathy towards him,all he wants is to introduce his children to the same delights he loved as a child.Only they’re not playing ball.Mini Mini chuckles and scrunches up some polenta before dropping it onto the floor.Mini leans in to her father and utters the dreaded word,the nail in the coffin of culinary aspirations. “No” comes the curt reply. “No” a little more forceful this time. Mini Mini has begun to chant too. She can’t say the word but she’s taking a pretty good stab at it. Mini giggles and complements this bizarre processed food cheerleading display to show off the new sign she has invented for waffles.Irish sign language doesn’t have one for the frozen potato product.Mini’s sign is like “chips” but performed on a larger scale.Makes total sense and for a moment I am stopped in my tracks at her ingenuity and sheer dogged determination. Then I remember that she had waffles yesterday and the day before that and the day before that.We had lapsed back into comfort food territory as she was suffering from an ear infection. “Waffles? Yay!”Mini has seized upon the one word she wanted to hear,has jettisoned the negative and is midway through her happy dance when the Frenchman pushes back his chair, scoops her up and plants her back on her seat in front of the offending meatballs. Cue tears. Big, fat three-year old’s tears that are full of shattered illusions about the world around her. The Frenchman puts his arm around her and explains for the umpteenth time that she cannot have waffles every day. Mini nods. “Yeah Papa,” then is all quiet and for a moment it looks like she is about to sample some of the meatballs. Then at the last moment, her spoon changes direction, away from her mouth and towards that of her father. He turns to her and it’s at that exact moment that she drops the spoon and inquires “Waffles?” one last time with her best wide Mini grin. The Frenchman laughs, capitulates and goes to get her precious waffles. Round 387 goes to Mini but the war rages on. Kids can be so persistent! 🙂 I’ve started a blog with food play activities for picky eaters at learntolovefood.com. I wonder if your Mini might like some of them! If you get a chance to check it out, I’d love to know what you think! Thank you,Ill check it out. Thanks, I’d love to know what you think! Haha that’s gas. Mini has really taken a stretch! She looks quite grown up. Yes,she is quite tall-not sure where shes getting that from as both her parebts are midgets!